2019 seems to be the year businesses want to get real about content marketing on LinkedIn, or give it another try. Some of our clients want to find out if LinkedIn can be used to bring in new business. I have been in meetings with several clients or potential new clients this year already on that topic. Here are a few of the talking points I usually raise in those meetings. Name 5 LinkedIn pages that provide great content! Normally I get no answer or max. 1 or 2 pages mentioned. Same for LinkedIn groups. I do get answers if I ask to name 5 people in their network that post a lot on LinkedIn. Questions like this are also a good opener for a content brainstorming and a talk about the actual audience that should be reached. Is organic reach better on LinkedIn? You wish! Let’s take a quick look at an example. 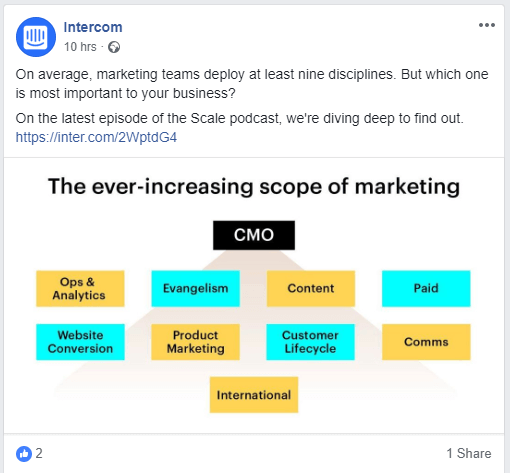 Intercom is a well-known software as a service company (and an example often brought up for being excellent in content marketing). Their newest podcast has been posted on LinkedIn (23K follower) and Facebook (31K follower). Okay, the post is still fresh, but not even a single like? They have 23K followers. What about the same post on Facebook? Not much better on Facebook. Meager two likes on a post published 10 hours ago. They got 31K followers on Facebook. Organic reach is low on LinkedIn. Don’t expect it to be any different to Facebook. How is a LinkedIn page different to a Facebook page? The basic idea is the same. Your business has a page people can follow. Content gets posted and people can share, like, comment. 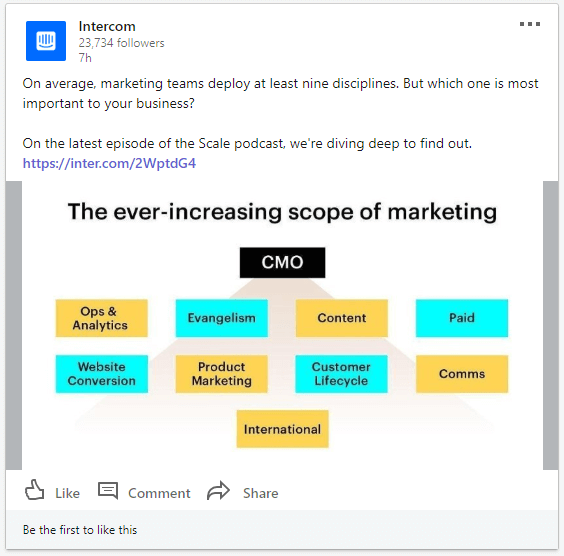 When it comes to the available post types, or content types you can post, LinkedIn is a little less advanced, or less focused on entertainment, then Facebook. The look and feel of a LinkedIn page is cleaner, and of course, focused on B2B. Take a look at the Slack LinkedIn page. 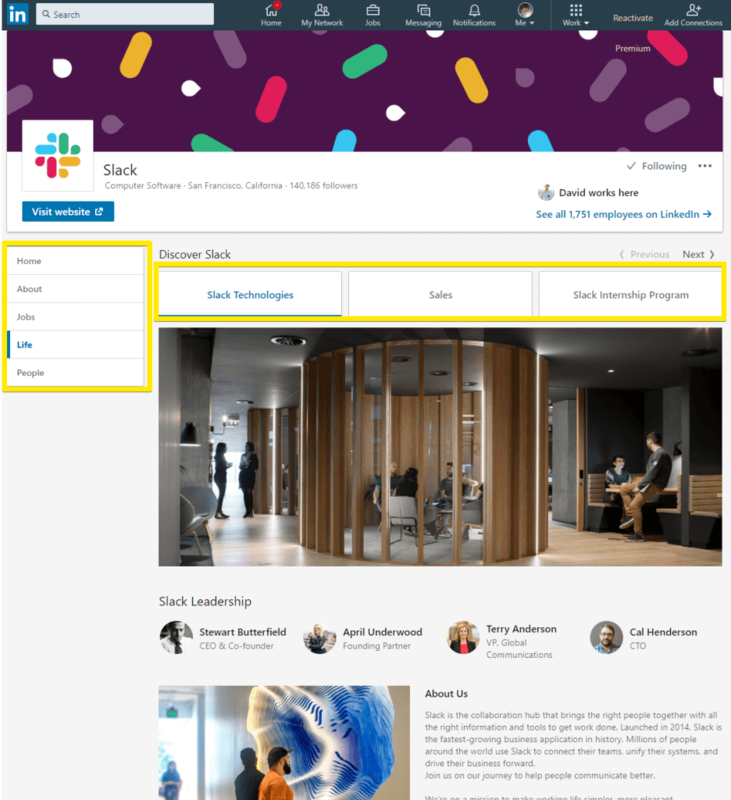 On the left-hand navigation you can browse open jobs, people working at Slack or click on “Life”. That opens up a page where you can showcase your company. This is very different from how you can present your business on Facebook. The “life tab” on LinkedIn pages is a paid feature – you have to enable the “Career Pages“. LinkedIn is somewhat intransparent on how much it does cost. Check out how you can set up the “life” tab on your LinkedIn page. Can you post the same content on LinkedIn and Facebook? In a perfect world, you would have endless resources to carefully craft each individual social media post for each platform (and have a different social media strategy in place for Facebook). That said, it is totally okay to post the same (B2B) content on LinkedIn and Facebook. You may have a different audience following you on each platform anyway. If you are a business selling to another business, LinkedIn is probably the more interesting platform on the long run. On the other hand, Facebook can be interesting for reaching a more diverse audience (hiring! ), and allows many more content types to play with (i.e. live streaming events). On Facebook, you can run small prototype campaigns, with a budget starting from 500 EUR. Not so on LinkedIn! 500 EUR is not enough budget to get any results that would allow you to make any decisions on further investment of your advertising budget. A cost per click from 5 to 15 EUR should not shock you on LinkedIn. You are targeting a business audience, not a consumer audience, and you can target specifically on job role, experience and so on. That’s the data LinkedIn is sitting on, and what they are charging you for. Content: Nobody cares about your team event pictures! We can share pictures from our new office! Let’s post pictures of our new hires! We have a team event next month, we could share some impressions! You get the picture. But: Who cares? It’s low hanging fruit content, everybody can post this. It is boring content. I do not say that this type of content is bad in general, but it’s not the content you should start with. Who, except the small audience who is already following your brand (your employees, clients, and partners you already have) on LinkedIn, cares about these pictures? LinkedIn is full of people and businesses spamming the platform with low-quality content. Share valueable content, yours or others! You want to find new business on LinkedIn, not only reach people that already know your business. Yes, it’s a group you can start with, or as Seth Godin would say, your tribe you can start with! If you want to grow your presence on LinkedIn, you can only do so by publishing excellent content. This is very basic, you would say. Yes, but still do so many businesses and people do not invest these 15-30 minutes to craft a social media update. It’s the busy season, and it’s easy to save some time by just throwing out a link. But if the author of a social media post does not care, why should your followers? Not every content you post has to be created by you! It is 2019 and everyone is aware of that. Show that you understand your market and audience, by providing content your target group is interested in. 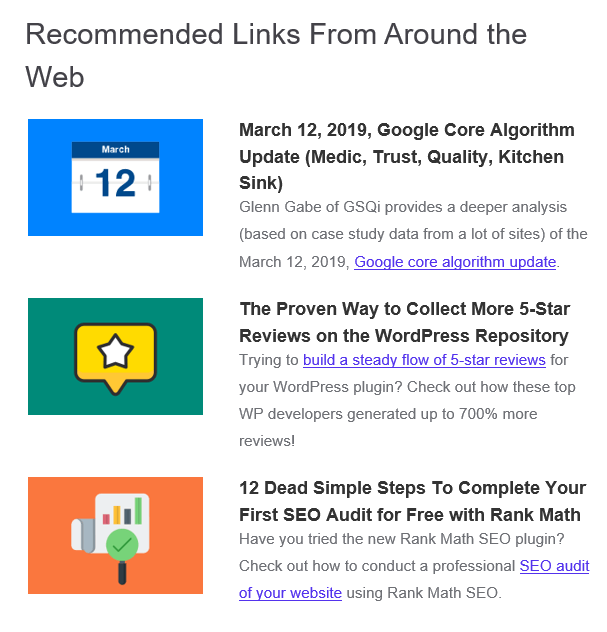 The Kinsta (a WordPress hosting company) newsletter is a great example, every edition holds a recommended links section. I always take a look at it! Sharing excellent content from others, a simple but effective way to get people to visit your LinkedIn page again and again. On Tagging: Let’s tag 15 people and add 20 hashtags! This is more an issue on personal profiles. I would suggest a more conservative approach. Yes, it’s cool to let everyone know you just finished a keynote, visited an event, ran into some buddies at the airport. But tagging everyone that comes to mind in one post, and adding 20 hashtags just to be sure, is not professional. And by the way, the LinkedIn algorithm does also not think that this is valuable quality content. Yes, you are the CEO and can request your sales team to share content! They are probably not good at that. Some will have a talent for it, others are just better at other things. Especially big corporations had lots of “social selling” initiatives, this then led to thousands of people posting the same content. It is annoying, and it will harm your brand and content marketing effort. Yes, provide content for your sales team, support them and provide feedback on posted content, but please do not require them to copy and paste content that the marketing team came up with. These are just a few of the talking points discussed in LinkedIn content marketing meetings. We have written lengthy content about content sharing done right, how to get your content marketing started, or how to repurpose existing content. Want to discuss some of those questions in detail? Get in touch!